BlockMaster Electronics, a leading supplier of terminal blocks for electrical and electronic distribution, announces the introduction of their new HP Series High Power Terminal Blocks. The new power blocks are rated 175 Amp and 600 Volt for electrical applications in power panel distribution. BlockMaster's new High Power Terminal Blocks are rated 175 Amp and 600 Volt for electrical applications in power panel distribution. The new HP Series High Power Terminal Blocks can also be used for lighter power applications, and therefore has extended utility as a “one size fits all” product line. Operating Temperature: -25° C to +125° C.
For more product information, as well as price and delivery, visit http://www.blockmaster.com for copies of data sheets on each of the six HP series High Power Terminal Blocks, or call BlockMaster at 847-956-1680. 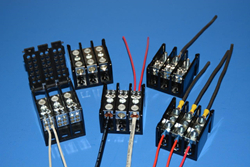 BlockMaster Electronics has provided innovative interconnect and terminal block solutions to electrical and electronic OEMs since 1994. The company has low-cost, high-quality manufacturing capabilities and is able to provide reliable products from stock.